You might be surprised to learn what the Dating Divas.com concluded was the #1 gift men really want. They asked hundreds of their male customers what they really wanted as a gift for Valentine’s Day. As a man, I believe it’s the same answer for any major gift-giving holiday; Father’s Day, Anniversaries, the Holidays and even Birthdays. And no – It’s not what you’re thinking! 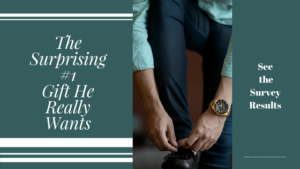 The #1 thing men wanted most as a gift was Quality Time with their partner. The men’s comments further explained that they really appreciate when their partner put some thought into planning their time together. Less surprising, of course, was #2, which was Intimacy and #3 was Food. Well, we are men after all! 81% of Americans would rather receive experience-based gifts than physical gifts. To further prove the point, can you really remember what gift you got for your birthday six years ago? I can! My wife started our tradition of giving experienced based gifts during our first year of dating when she surprised me with a Hot Air Balloon Ride for my birthday. It was an incredible day that neither of us will ever forget! Since then, we’ve continued to surprise each other with numerous concerts, events and activities that have created lasting memories. These memories are far more memorable than a physical gift will ever be and it doesn’t have to break the bank. Watch for deals on Groupon or Living Social for restaurants, activities and events that are in your area for significant discounts. 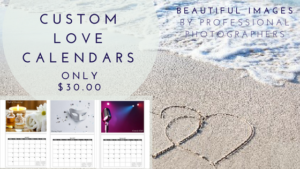 Start the tradition today and customize a Love Journal or Calendar with 12 months of dates that you select from our inventory of over 150 creative date ideas. It can start on any month, it’s super easy and makes a great romantic gift to give him for any occasion! After all, putting a little thought into selecting a date-a-month to spend quality time together is exactly what the surveys indicate makes the perfect gift! Perfect for Kids to Give to Dad Too! This also makes the perfect gift for the kids to give to their Dads! Pick 12 family friendly dates to go on together and create a Love Journal or Calendar for quality family time! We even have a pre-made Family Fun Calendar full of our more popular family style date ideas! We at Creative Commitments are dedicated to helping you make memorable moments together with the one you love. Please leave a comment below as we’d love to hear your thoughts on giving experiences as a gift or your most memorable date ideas!